Sashiko is a running stitch that was used in Japan and China as reinforcement stitches for high wear areas of clothing - elbow, knees, etc. This is my first attempt at sashiko. I've decided to start with a preprinted panel just to see if I'd enjoy it. I'm not even done with this first piece and I can already tell you this is something I'm really enjoying. It's very relaxing. 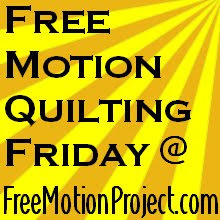 I can see many applications for this technique in many of my quilting projects. It's also not difficult. You're using a running stitch which most of you will be familiar with. The complexity will come from the pattern you choose to stitch. I'm about 1/2 way done with the panel you'll see below. I'll post the completed panel Friday. Cotton or Linen - While most recommend a looser weave, you can test the fabric using the sashiko needle and see if you're comfortable working with the combination for an entire piece. Alternatively, you can purchase a preprinted panel to work from. Sashiko Needles - Sashiko needles are larger than what we may be used to using. The eye is large to accommodate the sashiko thread. They come in different lengths. You should try a few to see what works best for you. Sashiko Thread - This is a soft thread. The one I am using has 6 twisted threads sets. Each set is heavier that average quilting thread. 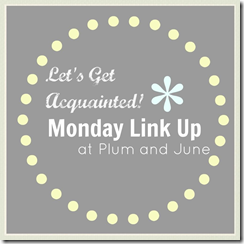 Handle your thread very carefully. I made a big, hot mess of my thread and am having to deal with the consequences. 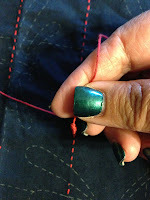 When you open it up and lay it out, one side of the thread loop has a small thread wrapped around it. If you hold this point, and pull the thread up off the table, it will open out nicely. Then you can cut it into lengths. Thimble - I'd recommend a leather thimble. 1. Thread and knot your needle. Use whatever method you're most comfortable with. I loop the end around my index finger 1 1/2 times. Then I roll it off with my thumb and pull it tight to create a knot. It's not the prettiest or neatest not, but it works for me. 2. Choose your starting point. Start by choosing the longest stabilizing line. My panel has a grid on it so I am working from the center out. You'll want to start with the straight lines and then move to any curved lines. 3. Insert your needle from wrong side of fabric. Start from the wrong side of the panel and push your needle through to the right side starting at the beginning of the marked line. 4. Take several running stitches. 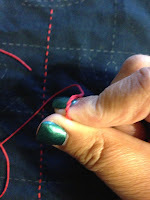 Using the pattern marking as a guide, take several running stitches. 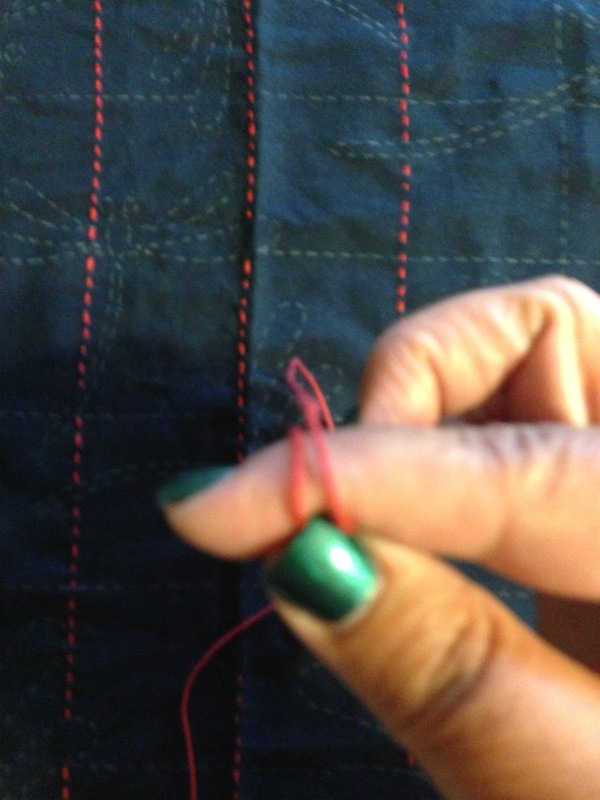 Be sure to cover the marked areas with your thread and move back down to the underside in the areas with no marking. 5. Continue straight line running stitches. You may have noticed in the picture above that the needle comes back up on the other side of the dragonfly's wing. As you're traveling along, be sure you travel underneath pattern areas to continue your line. 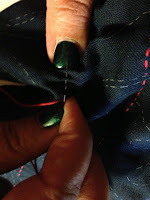 I have found the quickest and easiest way to do this is to scrunch the fabric in my left hand and stab through the fabric with the needle in my right, rocking the fabric as I go. These shouldn't be tight stitches either. They should lay gently on the fabric. 6. Pull the fabric to settle the stitches. 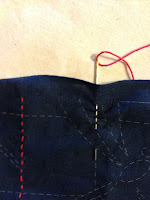 You'll have to gently tug the fabric in the direction of the stitches to settle them into place. Continue in this way until you have completed all the straight lines in your piece. 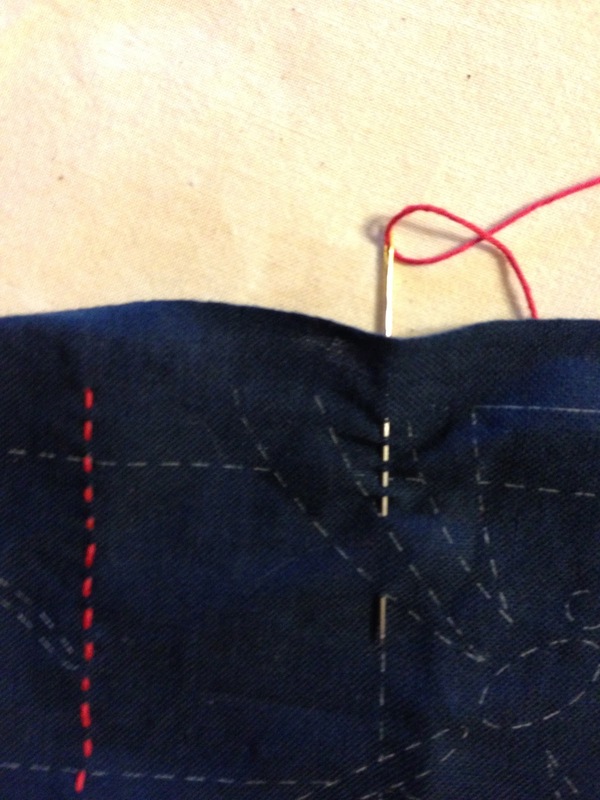 You'll stitch these lines in the same way you've stitched the curved lines. You may want to switch to one of the shorter needles - personal preference rules here. Once you're piece is completely stitched you can use it for whatever you'd like. In parts of Japan, they're used as dust rags! I'll be using mine for a quilted wall hanging. I'm going to add a border. Then I'll be using a matching thread to stitch a dense filler design all over, except for the dragonflies. I want them to really pop up off the surface. I'll likely use two layers of batting to make sure it's pronounced. I have seen the knotted ends left floating at the edge of the pattern as a design element. In my project it would be at the end of each grid line. In that case, you'd want to use a cute little knot or maybe a knot with a short tail. Indigo bleeds so wash it separately after you finish the stitches. You may want to use a color catcher or a cup of vinegar. If it bleeds onto your thread, this is characteristic of traditional sashiko and isn't necessarily a bad thing. Again, personal preference rules here.